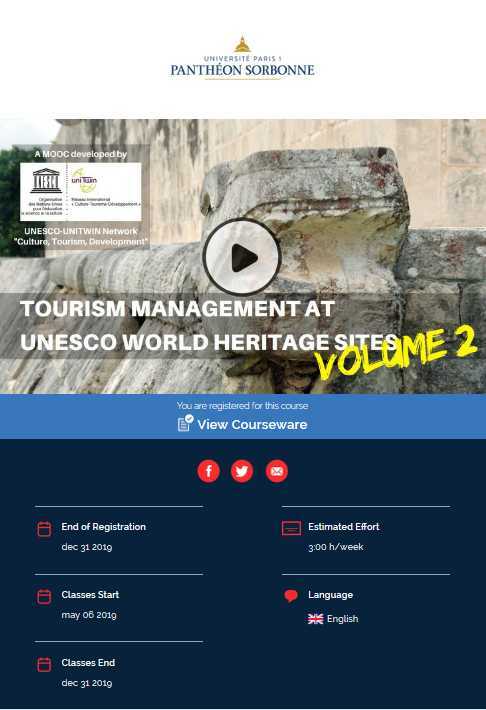 After the great success of the first volume (6’500+ learners from 166 countries), a brand new volume of the Tourism Management at UNESCO World Heritage Sites MOOC (Massive Open Online Course) opens its doors to all tourism professionals, students, site managers, policy makers and other interested learners. Together with the UNESCO UNITWIN Network “Culture, Tourism, Development” leader Paris 1 Panthéon-Sorbonne University (Paris, France), the UNESCO Chair based at USI has been once more responsible in designing and developing it. For this volume, the Chair coordinator Silvia De Ascaniis has contributed with a case study to the module on Religious Tourism. Additionally, prof. L. Cantoni is co-coordinating it. This year’s MOOC focuses specifically heritage communication, management and marketing. Highly profiled researchers of the international university network UNESCO UNITWIN Network “Culture, Tourism, and Development” share their knowledge on the main aspects of this topic and provide insights into the main tourism issues at UNESCO World Heritage Sites. The course will be held in English and is completely free and open. The course start date is scheduled for the 6th of May 2019 on the French platform FUN MOOC. It is organized in 6 thematic units, unveiled every week. Ad-hoc didactic videos and documents, quizzes, additional materials, and activities aimed at fostering experience sharing among participants will be at the centre of this learning experience. Learners successfully completing the course will then receive a free course completion certificate. Anyone is welcome to register regardless of whether they have participated in the first volume or not!